Joe Gibbs Racing development driver Matt Tifft juggles rides with a number of teams, many types of race cars (and trucks), and school and work – a busy life for a young man who turns 20 at the end of June. Learn more about this up-and-coming – and busy – driver, and new member of the NASCAR Next program, in this week’s Fast Facts. Matthew Tifft was born June 26, 1996 in Fairfax, VA, and grew up in Hinckley, OH with siblings Maggie and Morgan. Tifft grew up attending dirt late model races with his father’s team, and got into a go-kart himself for the first time in fall 2007. In 2009 he earned his first two national level victories. In 2010, Tifft moved up to dirt and asphalt super late models, winning twice in 2011; he also finished in the top 10 in points at the World Series of Asphalt Stock Car Racing at New Smyrna (FL) Speedway. In 2012, he was named Rookie of the Year on the ARCA Midwest Tour and finished fifth in points. 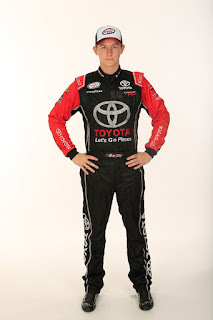 In 2013, Tifft competed in the K&N Pro Series East and selected ARCA races for Win-Tron Racing, and in 2014 signed with Ken Schrader Racing, registering seven top 10 finishes in 10 ARCA events; he also made his Camping World Truck Series debut for BJ McLeod Motorsports at Martinsville late in the season, finishing eighth. In 2015, Tifft raced 12 times for Kyle Busch Motorsports in the Truck Series, picking up five top 10 finishes, and competed for Ken Schrader Racing and Venturini Motorsports in ARCA competition, finishing a career-best second in Nashville; he also made his Xfinity Series debut with JGR, finishing 10th at Kentucky. For 2016, Tifft will race part time in both the Xfinity Series for JGR and the Truck Series for Red Horse Racing. Tifft is currently a student at UNC-Charlotte studying business. Learn more about Tifft at his website, www.matttifftracing.com.